This entry was posted in Client News and tagged Binghamton University, Reader's Digest, Sodexo on November 9, 2017 by intoone. For the first time in the United States, Starbucks is officially challenging their partners to make the best latte art, espresso drinks, and be even more knowledgeable about coffee. Joshua Meekins, a talented Starbucks barista for Sodexo at Liberty University, won for Virginia during the primary stages of the Starbucks Barista Championship. Challengers must be able to create a perfect flat white, create a beautiful custom hot espresso beverage, and talk about the core Starbucks coffees in a knowledgeable way and to guide a customer in picking out a perfect at-home coffee. Meekins was selected from eight participants in Virginia and Tennessee. He and another semifinalist from Tennessee were reviewed for their performance by the Starbucks regional manager, who then chose who advances to the next level of competition in Atlanta. This entry was posted in Client News and tagged Liberty University, Sodexo, Starbucks on May 29, 2015 by intoone. Sodexo at Framingham State University recently received an Employer Recognition Award from the Greater Worcester Employment Resource Collaborative (GWERC). The award recognizes businesses, institutions, and organizations in and around the city of Worcester that go “above and beyond” expectations in promoting the hiring of qualified persons with disabilities. GWERC recently held a breakfast in May at Worcester Technical Vocational High School to honor employers. Community Enterprises, a member of GWERC for approximately five years, meets once a month to discuss potential job leads. There are members of local businesses in attendance that keep everyone up-to-date on job openings at their business. Also it is a place where job seekers can come in and bring their resume for feedback. Nulu Nalunga came to Community Enterprises from MRC last fall with a food prep certificate in hand. And the job hunt began-Nulu was motivated, Sodexo at Framingham State University was contacted, and set up a meeting with the operations manager Stoyan Mihnev, and told him of Nulu’s qualifications. After thinking about it for a bit, asking lots of questions, he did what most employers should do. He took a chance and called her in for an interview. Not only did he take a chance -he and his staff showed a tremendous amount of patience throughout the entire training and hiring process. There was so much teamwork involved, and everyone was learning as they went along. Nulu needed 2 CDI interpreters, and 2 ASL interpreters for the interview process and training periods. It took twice as long, but paid off for everyone in the end. Stoyan Mihnev and Eric St. Onge –Nulu’s direct manager helped Nulu get her feet off the ground any way they could by educating the staff, helping Nulu came up with different ways to communicate with her coworkers, and by providing reasonable accommodations so she could excel at her position and overcome communication barriers. She does everything now from cleaning, food prep and serving hot meals. She is now a 40 hour a week employee and even got a summer job working for Sodexo at EMC. This entry was posted in Client News and tagged Framingham State University, Greater Worcester Employment Resource Collaborative, Sodexo on May 29, 2015 by intoone. For the seminarian community at Theological College, one day each month is set aside for the purpose of fasting. Through an initiative by the school’s Social Justice Committee, in cooperation with dining services partner Sodexo, these missed meals are now donated to the needy. The food donation program is aligned with Sodexo’s Stop Hunger commitment and the Social Justice Committee’s dedication to service for the poor. 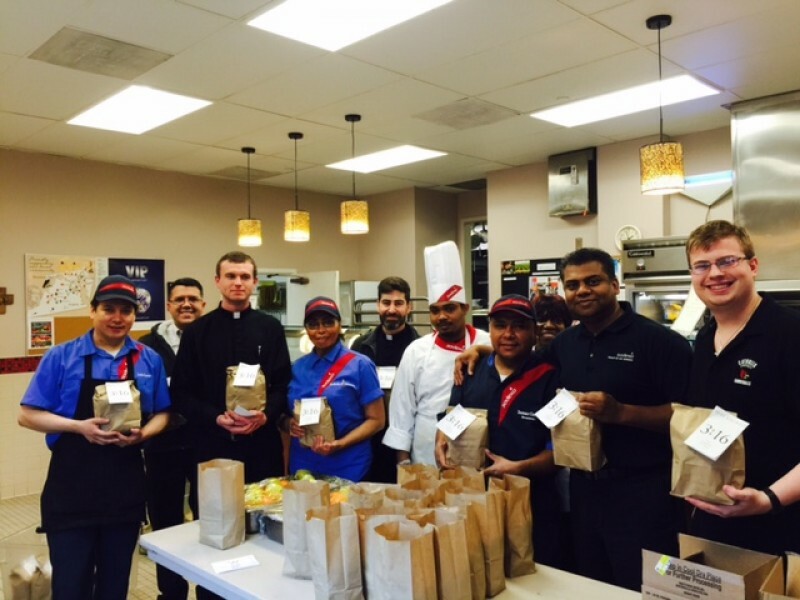 Together, seminarians and Sodexo staff are preparing and distributing box lunches to area shelters and the homeless. Father Phillip Brown of Theological College is passionate about reaching the less fortunate in the DC community and has given his blessings for this initiative. This entry was posted in Client News and tagged Sodexo, Theological College, Washington DC on April 20, 2015 by intoone. 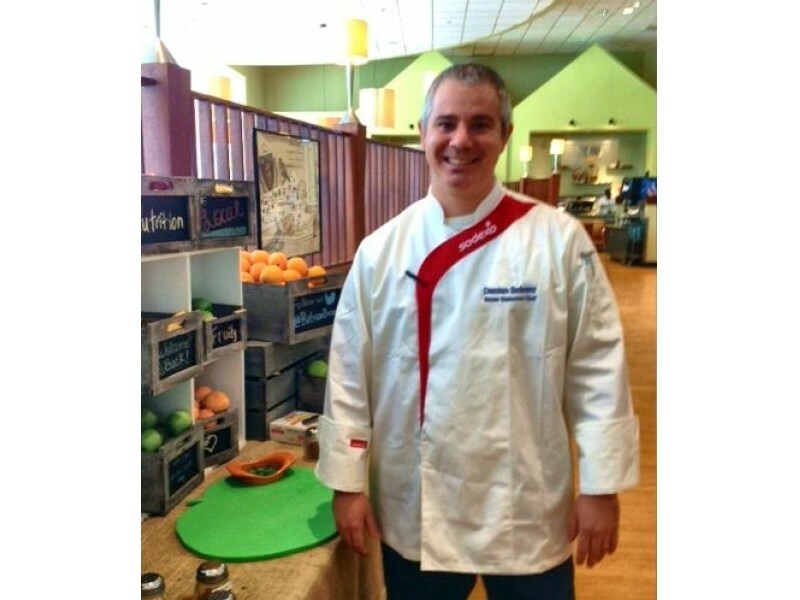 Executive Chef Damian Zedower, a five star, five diamond hotel veteran has joined the team at Babson College Dining by Sodexo. Chef Zedower began his career working as a line cook in New York City’s hot restaurant scene and after graduating from the Culinary Institute of America in Hyde Park, New York, Zedower set his sights on Boston. In Boston, Zedower worked for Chef/Owner Frank McClelland at L’Espalier and following his trend for working with great chefs, Zedower moved onto work for the Five Star, Five Diamond Hotel Boston Harbor and Executive Chef Daniel Bruce. After further honing his culinary skills, Zedower moved West to San Diego and worked for the La Jolla Beach and Tennis Club and Celebrity Chef Bernard Gillas. Following his wife’s advice he then joined the Four Seasons family, starting as opening Chef of the Four Seasons Residence Club Aviara, subsequently opening the Four Seasons Jackson Hole, and the Four Seasons Palm Beach. Zedower then had the honor of being part of the opening team and sticking with his trend of working for/with the best, Zedower had the honor to open the Mandarin Oriental Boston as the Executive Sous Chef (a Five Star – Five Diamond Hotel). He soon was asked to lead the team as Chef of the Hotel and with lots of hard work the team achieved in a short time the Four Star rating at Restaurant Asana. Chef Zedower’s other executive chef positions include the Amangani Resort Jackson Hole, WY and most recently the Beacon Grille in Woburn, MA. Having grown up in an Italian family, food is a very important part of Zedower’s life. Zedower’s fondest memories of his childhood were cooking the Sunday family feasts with his grandmother and aunt. Zedower now loves cooking for his growing family lead by his supportive wife Tarrah and his two hard working Sous Chef’s Callie 5 and Caden 3. This entry was posted in Uncategorized and tagged Babson College, Sodexo on February 20, 2015 by intoone. Shannon Miller remains the most decorated gymnast in American history and the only American to rank among the top 10 all-time gymnasts. She is the only female athlete to be inducted into the U.S. Olympic Hall of Fame – twice. Who better to engage students and the surrounding community in a health and wellness initiative at Binghamton University? Miller’s two-day visit begins Monday, Feb. 4, when she will be the featured speaker for the Binghamton University Athletics Club during the eighth annual Bearcats Celebrating Women’s Athletics Luncheon. The event recognizes achievements and raises scholarships for the University’s female student-athletes. This entry was posted in Client News and tagged Binghamton University, Shannon Miller, Sodexo on February 6, 2013 by intoone. © , In Toone Communication, All Rights Reserved.